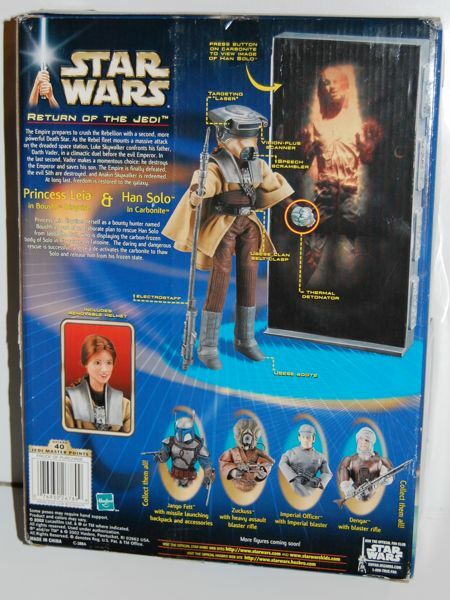 Hasbro released this set in 2003, back before Sideshow Collectibles had the license to make 1/6 scale Star Wars figures (like their own version of Boushh). It comes with one Leia as Boushh figure (which is closer to a Barbie doll than a modern 1/6 scale figure) and one light-up carbonite block. Overall, the figure isn’t terrible, but the proportions do seem a bit off due to the oversized helmet. The body is only just barely posable compared to a modern 1/6 scale figure. This is actually the second 12″ Han in Carbonite that Hasbro released. 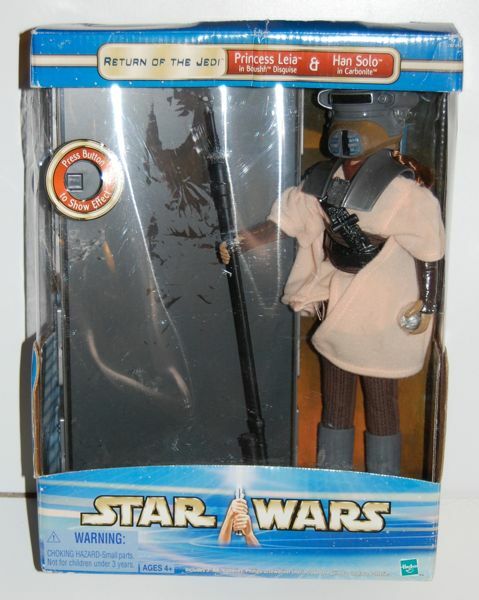 The first version was sold in a set with a Han Solo figure and was completely sculpted. It’s actually still a decent alternative if you want a cheap Han in Carbonite for your Sideshow figures, if perhaps a bit oversized. This one is not as impressive at first glance, since it’s completely flat on the surface, with just a hint of Han painted on the surface. But press the small button on the upper left and you get a “melting” effect that is actually pretty cool. It fades in realistically and since you can see into the block it looks kind of like Han is actually starting to come out from inside the block. I got this for a song on ebay, but I can’t really recommend the set given that Sideshow’s version of Boushh is very cheap on the secondary market. If you don’t want to go whole-hog and get the Sideshow Han in Carbonite display, you can still pair the Sideshow Boushh with the other Hasbro carbonite block (also very cheap) for a pretty decent looking display for very little money.